The Department of Justice (DOJ) is planning to investigate and possibly sue universities over admissions policies that discriminate against white applicants, The New York Times reported on Tuesday, citing a department document. The internal memo seeks lawyers in the department’s Civil Rights Division who are interested in working on a new project on “investigations and possible litigation related to intentional race-based discrimination in college and university admissions,” according to the Times. For supporters of affirmative action in college admissions, the news was a shock. Just over a year ago, the U.S. Supreme Court upheld the admissions policies of the University of Texas at Austin, which include consideration of race and ethnicity. Many college leaders feared, prior to that decision’s announcement, that affirmative action was endangered. But the decision—coming just three years after another Supreme Court decision upholding affirmative action—assured many that colleges could continue to consider race in admissions. The DOJ document suggested the project would be run out of a part of the Civil Rights Division where its political appointees work, rather than the educational opportunities section, which is devoted to handling cases involving universities and is run by career civil servants. While the document does not explicitly identify whom the department considers at risk of discrimination, the Times suggested the use of the phrase “intentional race-based discrimination” signalled that programs designed to bring more minority students to university campuses are being targeted. “By assembling a team of attorneys in the front office of the Civil Rights Division to focus on so-called ‘intentional race-based discrimination’, this Justice Department is laying the groundwork to attack policies that help promote racial diversity at colleges and universities,” Kristen Clarke, president and executive director of the Lawyers’ Committee for Civil Rights Under Law, said in a statement. Clarke noted that this isn’t the first time Attorney General Jeff Sessions has tried to curtail affirmative action policies. Race-conscious affirmative action has been used for decades to address past inequities and offer students from disadvantaged minority groups—especially African Americans and Latinos—a better chance at gaining access to college. The policy has come under fire in recent years, however, and eight states already ban affirmative action admission policies. The U.S. Supreme Court’s ruling last summer that the use of race as a factor for admissions is lawful was hailed as a win for affirmative action supporters. However, the opinion in the 4-3 decision left the door open to potential future legal challenges in reminding the University of Texas—and by default other schools that use race-conscious admissions policies—that its admissions process isn’t necessarily the best way to address lack of diversity. 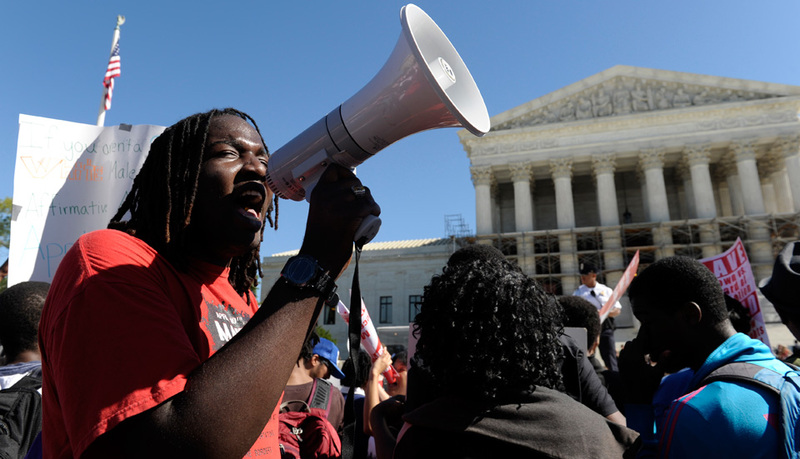 The court is now poised to consider race-based admissions policies yet again. In addition, the Department of Education is also weakening its civil rights division, starting with Education Secretary Betsy DeVos and her pick to head it. The new acting head of the U.S. Department of Education’s Office for Civil Rights once complained that she experienced discrimination because she is white. As an undergraduate studying calculus at Stanford University in the mid-1990s, Candice Jackson “gravitated” toward a section of the class that provided students with extra help on challenging problems, she wrote in a student publication. Then she learned that the section was reserved for minority students. In June, the education department announced it would scale back civil rights investigations at the nation’s public schools and universities, easing off mandates imposed by the Obama administration that the new leadership says have bogged down the agency. “Affirmative action is rooted in our nation’s fundamental commitment to equality, a commitment this administration woefully lacks and has expressed hostility towards,” Sherrilyn Ifill, president and director-counsel of the NAACP Legal Defense and Educational Fund, Inc., said in response to the change. Ifill said this is just the latest in a string of attacks from the Justice Department on civil rights, including LGBTQ discrimination, voter suppression, and endorsing police violence. “We will bring the full force of the law if this Justice Department attempts to resegregate our institutions of higher learning,” Ifill said.